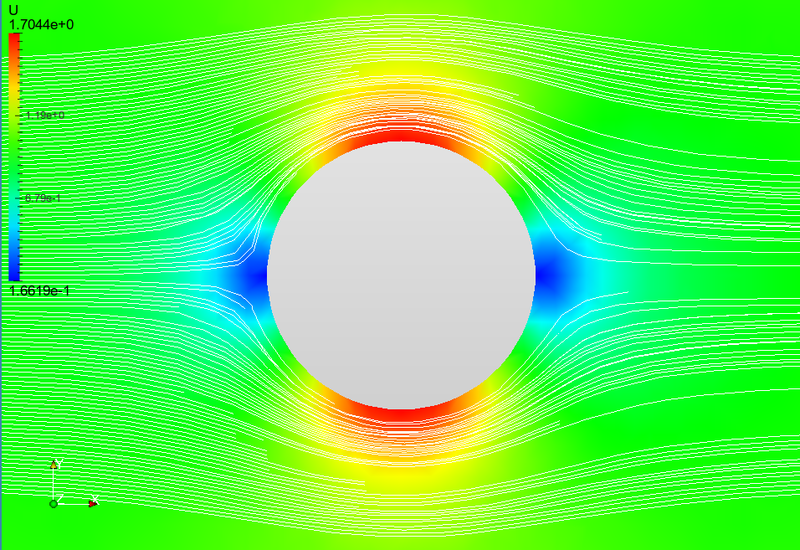 The potential flow analysis could be used to run simulations in which the velocity field is irrotational. This assumption is valid in several applications. This analysis type is most frequently used to initialize the flow field for a simulation. It solves Laplace’s equation to compute the velocity potential from which the velocity field is derived. The flow is considered incompressible and inviscid. Potential flow is considered to be a very basic form of fluid flow. Since the flow is considered irrotational, vortices or turbulence effects cannot be modeled. In the following, potential flow simulation setup is discussed. For all cases, OpenFOAM® solver potentialFoam is used. In order to perform a potential flow simulation on a given domain you have to discretize your geometry by creating a mesh. Details of CAD handling and Meshing are described in the Pre-processing section. Initial and boundary conditions need to be set. In this analysis type, the computational domain will be solved for two fields: pressure (p) and velocity (U). As a general rule for CFD simulations, all field conditions must be well-defined on all boundaries. Therefore, it is very important to define appropriate initial and boundary conditions for all variables on every boundary. Find all of the following example applications for a potential flow analysis in the SimScale Project Library. Potential flow analysis is performed using the OPENFOAM® software. See our Third-party software section for further information.